When running in SolrCloud mode, a "Cloud" option will appear in the Admin UI between Logging and Collections. Click on the "Cloud" option in the left-hand navigation, and a small sub-menu appears with options called "Nodes", "Tree", "Graph" and "Graph (Radial)". The sub-view selected by default is "Graph". 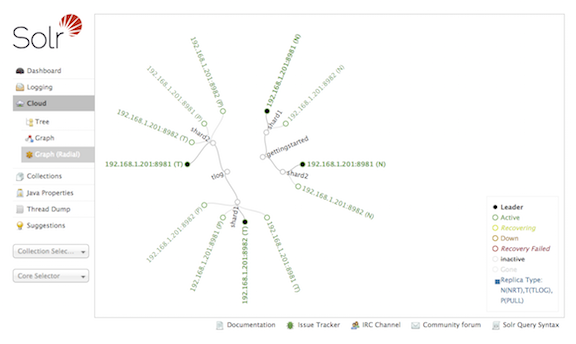 The "Nodes" view shows a list of the hosts and nodes in the cluster along with key information for each: "CPU", "Heap", "Disk usage", "Requests", "Collections" and "Replicas". The example below shows the default "cloud" example with some documents added to the "gettingstarted" collection. 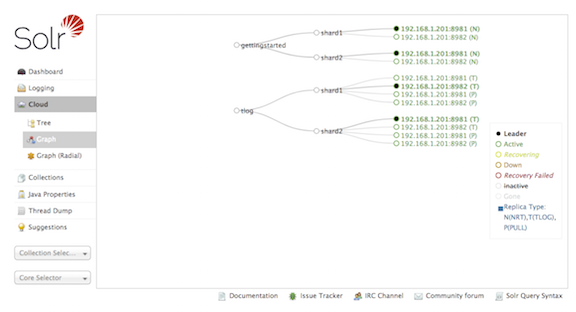 Details are expanded for node on port 7574, showing more metadata and more metrics details. The screen provides links to navigate to nodes, collections and replicas. The table supports paging and filtering on host/node names and collection names. 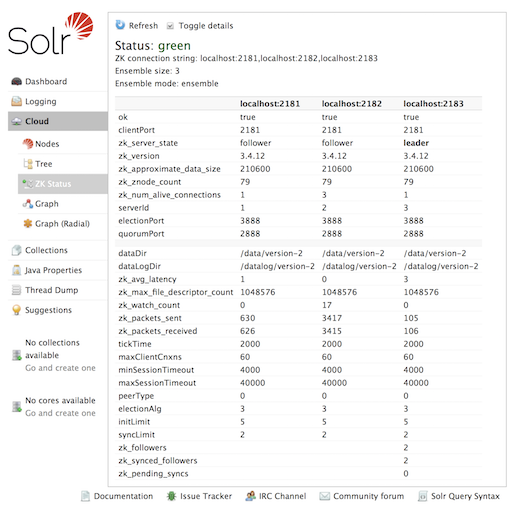 The "ZK Status" view gives an overview over the ZooKeeper servers or ensemble used by Solr. It lists whether running in standalone or ensemble mode, shows how many zookeepers are configured, and then displays a table listing detailed monitoring status for each of the zookeepers, including who is the leader, configuration parameters and more. 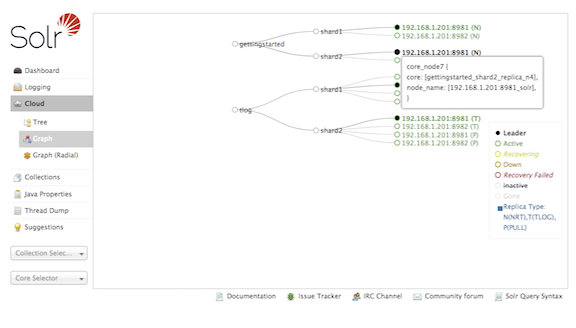 The "Graph" view shows a graph of each collection, the shards that make up those collections, and the addresses and type ("NRT", "TLOG" or "PULL") of each replica for each shard. This example shows a simple cluster. 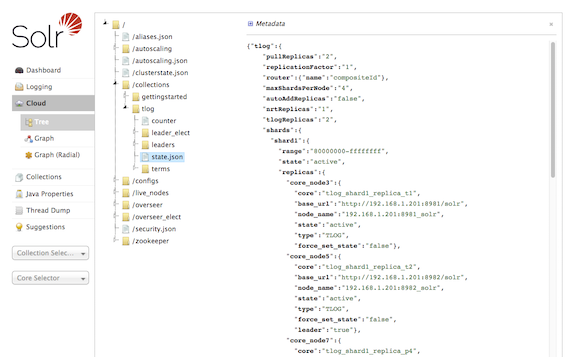 In addition to the 2 shard, 2 replica "gettingstarted" collection, there is an additional "tlog" collection consisting of mixed TLOG and PULL replica types. Tooltips appear when hovering over each replica giving additional information.